What do fairy tales reveal about the values shared in many cultures? Watch Ever After directed by Andy Tennant and explore character traits that accurately describe protagonists and antagonists, the good and the bad. 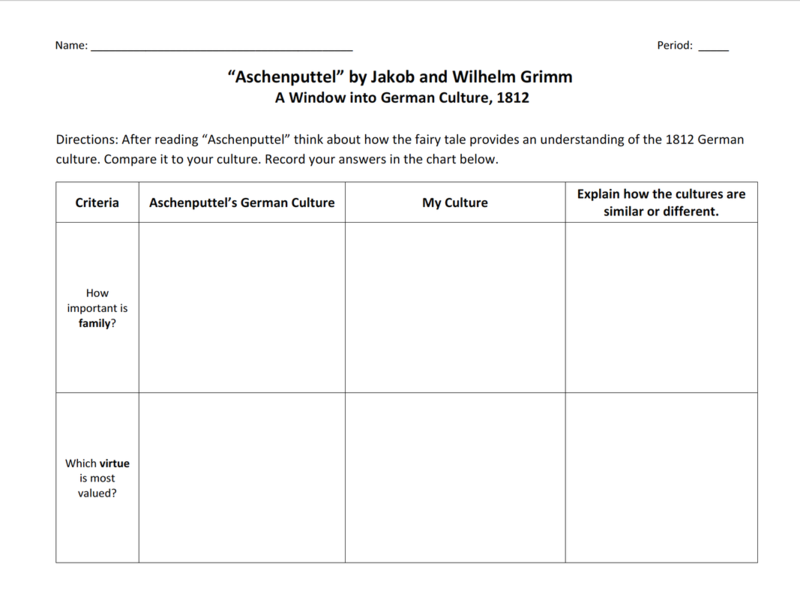 Read "Aschenputtel" by Jakob and Wilhelm Grimm and determine how the legend of the hazel tree and the resolution contribute to the theme. Read "Yeh-Shen" by Ai-Ling Louie and compare and contrast the fairy tale elements of the Chinese tale to the 1812 Grimm version. 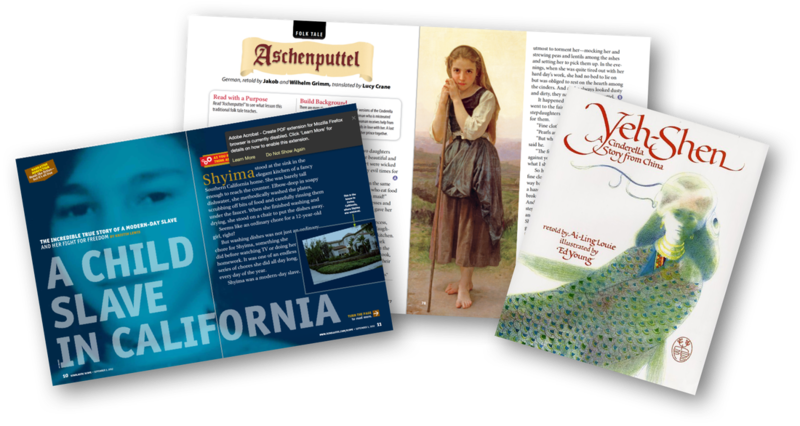 After reading "A Child Slave in California" (Scholastic Scope, September 2012) discuss whether Shyima's story can be classified a modern Cinderella tale. Students put annotation skills to use in preparation for the compare and contrast essay. Explore character trait vocabulary that describes good and evil characters. Identify the theme and discuss how the symbolism and resolution contribute to the theme. 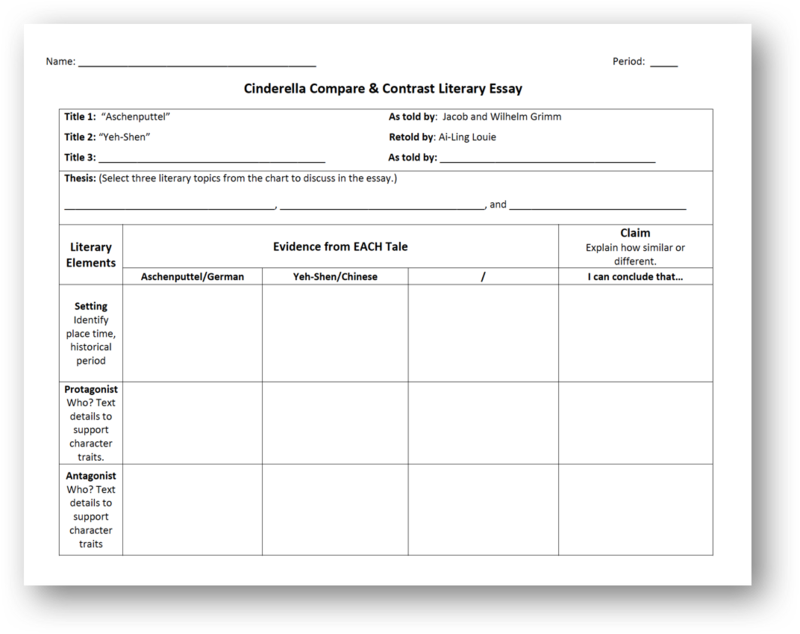 Write an essay comparing and contrasting the literary elements from "Aschenputtel" and "Yeh-Shen"
In groups determine whether or not Shyima's story can be considered a modern Cinderella tale. Note: You have permission to use my ideas and resources for nonprofit educational purposes only. Essential question: In your opinion, could Shyima's story be classified to as a modern day Cinderella tale? Essential question: How does the resolution contribute to the author's message? Essential question: How do the elements of fairy tales from different cultures compare and contrast? Essential question: How does legend of the "The Hazel Branch" help you to better understand the symbolism of the hazel twig in "Aschenputtel"? Essential Question: How is the portrayal of Aschenputtel in "Aschenputtel" and Danielle in Ever After similar and different? Essential question: What message is the song sending to young girls today? After watching Ever After, discuss positive and negative character traits that describe Danielle (protagonist) and her stepmother (antagonist). Use a thesaurus, hard copy or online, to explore plausible synonyms for the three categories shown in the picture below. Student sort their words into the categories. Discuss and clarify the subtle differences in meaning. The world wall serves as a reference during discussions and writing activities. Wow! Look at the vocabulary being used in our classroom. Students sorted synonyms into categories. Students receive an envelope at the beginning of class. Each envelope contains a set of words and matching definitions cut into strips. Their goal is to try and match the words to the definitions. It is a great way to assess prior knowledge. At the end of class, the activity is repeated to assess their improved understanding of the words. This word sort activity is a great bellringer. 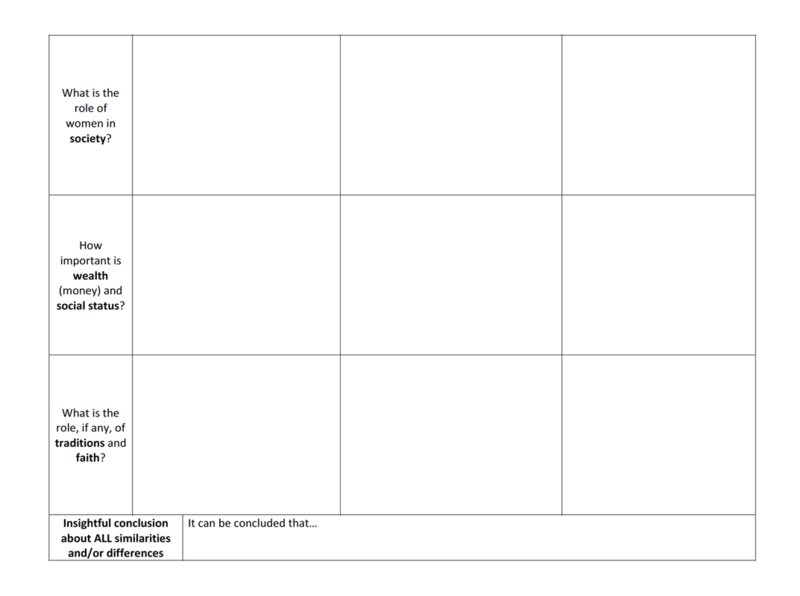 Use the compare and contrast matrix to take notes during reading. 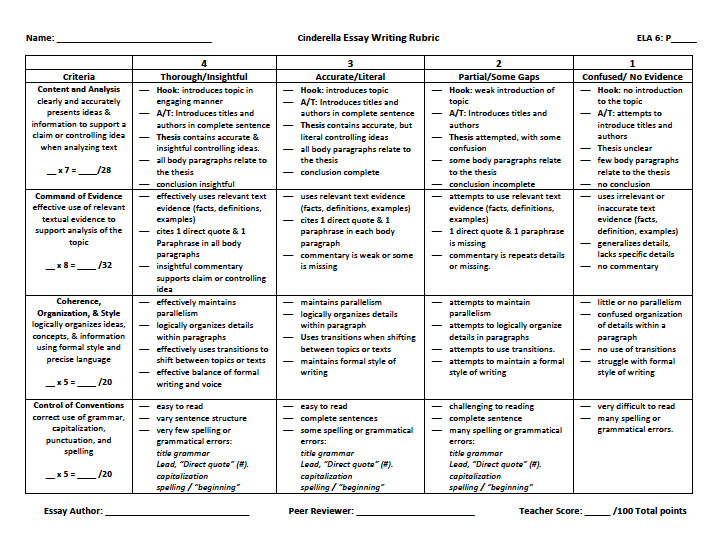 This matrix is modified to provide enrichment, allowing students to explore a third tale from a different culture. Students select two literary elements from the compare contrast matrix to focus on in the essay. They transfer relevant details from the compare and contrast matrix to the essay graphic organizer. 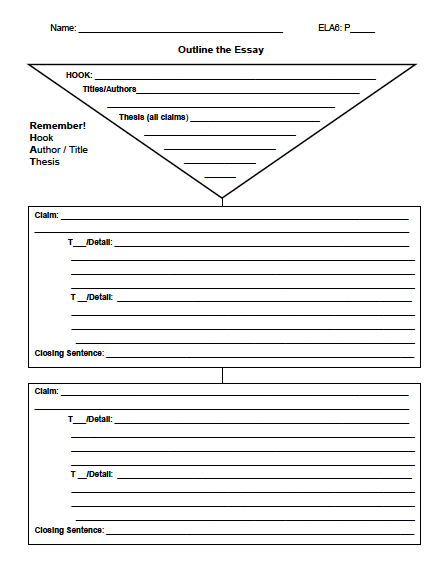 The writing skill focus is on parallel structure, organizing the claims and text evidence in a logical order, the order that they are introduced in the thesis. How does Frederick Hall's impression of Grimm's Cinderella connect to the story you read in class? Photo Credit: Used with permission of the Arts Renewal Center. Frederick Hall (1860-1948), Grimm's Cinderella, 1891. 1. "Aschenputtel." Grimm, Jakob and Wilhelm. Trans. D. L. Ashliman. Kinder- und Hausmärchen, 1st edition. Berlin: Realschulbuchhandlun. 1812. 2. Ever After. Dir. Andy Tennant. Perf. Drew Berrymore. 20th Century Fox Film Corp, 1998. DVD. 3. Louie, Ai-Ling , and Ed. Young. Yeh-Shen: A Cinderella Story from China. New York: Philomel, 1982. 4. Lewis, Kristin. "A Slave Girl in California." Scope. New York: Scholastic. 3 Sept. 2012. 5. Rele, Sonya. "Strong." Cinderella [Original Motion Picture Soundtrack]. Walt DisneyRecords, 2015. CD.